I recently stumbled across a hitherto unknown gem inside Windows Vista–to me, anyway. It’s called a “System Health Report” and it provides a pretty comprehensive view of a Vista system’s state, status, and current behavior. 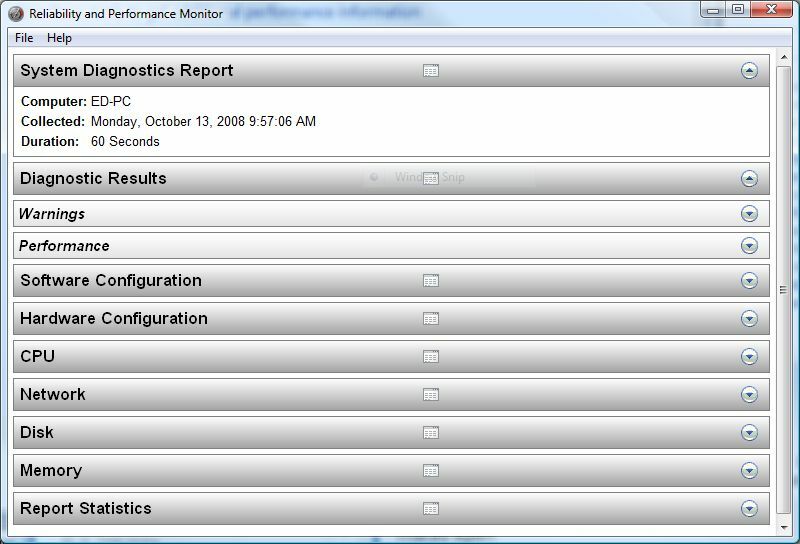 To my surprise it comes from the same facilities that support the System Reliability Monitor (see my blog “My Love-Hate Relationship with System Reliability Monitor” for my take on this built-in Vista facility) and generates a report on all major components and subsystems on the Vista PC it targets. Click Start, type Performance into the Vista search box, then select Performance Information and Tools. Click Advanced Tools in the left panel. Click Generate a system health report. Once the data-gathering phase is complete, you’ll see an overview report appear instead. It offers details in a number of areas, including Diagnostic Results, Software and Hardware Configuration, and details for CPU, Network, Disk, and Memory, as well as Report Statistics. The overview report looks pretty innocuous, but you can click the arrow to the right that’s associated with any item on the left to start digging into the details. Here, you can see the various warnings that my Vista machine collected as I ran this report. 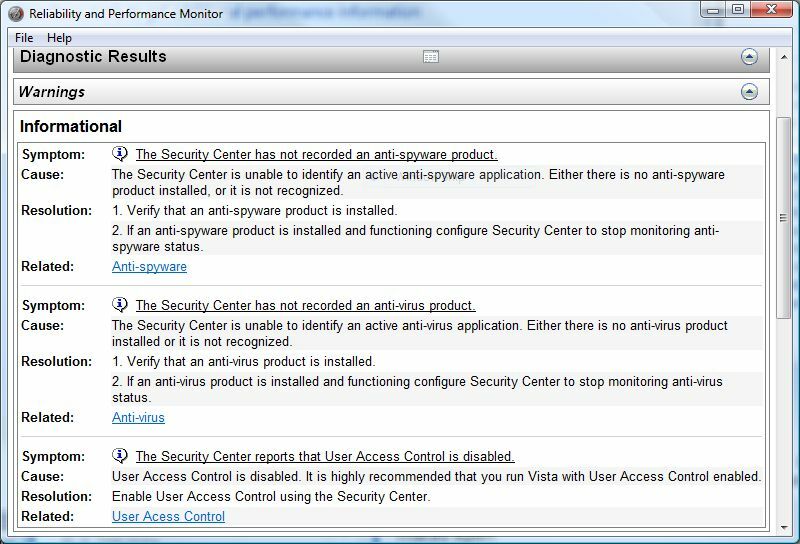 These reflect my having turned User Account Control (UAC) off on this machine, and the interesting failure of Spyware Doctor with Antivirus to register either of those components–antivirus and antispyware, that is–with the Microsoft Security Center on this machine. In this case the former is a deliberate choice, and the latter a known issue (though Spyware Doctor maintains updated signatures and software as it’s supposed to, so there’s no real cause for concern here). If you manage a large number of Vista desktops, you may be interested to learn that this facility dovetails with products that include System Management Server or System Center Essentials to enable daily health reports to be e-mailed from each machine to a mailbox for subsequent analysis and review. 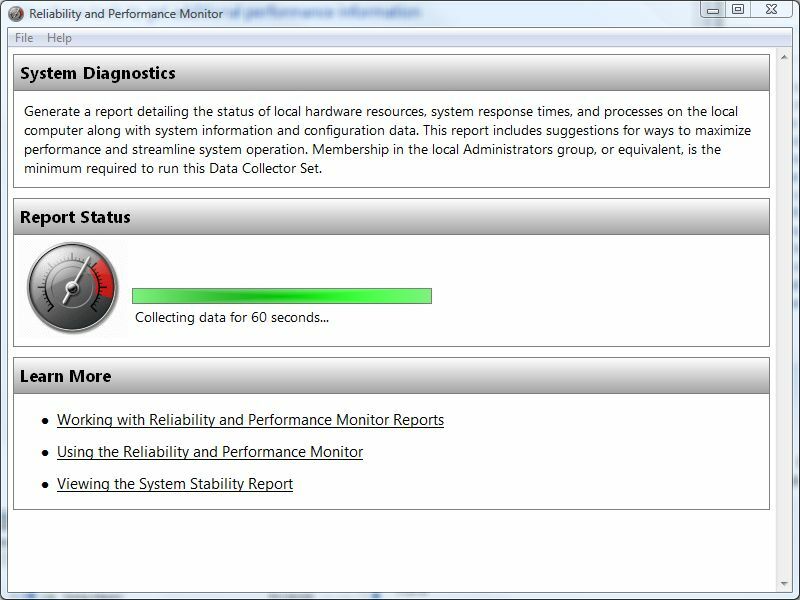 For some more good information on working with this facility in Vista, see “Scenario 6: View a diagnosis report” in the Windows Vista Performance and Reliability Monitoring Step-by-Step Guide on TechNet.